A group of German scientists is making great strides to improve robot mobility. Their project is called iStruct, and their flagship invention is a robot ape, because they’re apparently trying really hard to get some kind of Planet of the Apes/robot enslavement thing going. Working at the German Research Center for Artificial Intelligence, the team constructed a four-legged mobile robot that can walk on two or four legs. It not only walks like an ape; it looks like one as well. Its actuated spine and smart sensors let it stay upright even in situations that would knock other quadrupedal robots over. 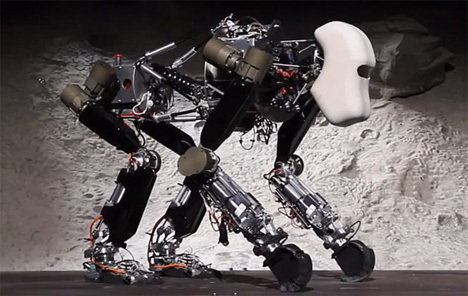 Like an actual ape, the robotic ape usually walks on all fours but is able to stand on two legs to give it a little more height for performing important tasks. One of the demonstration videos for the robot shows its smooth transitions from forward walking to reverse. It also illustrates its balancing abilities by putting it on a shifting platform. Sure, it looks interesting now, but just wait until it learns how to love.